Radio Design Managing Director, Eric Hawthorn, welcomed Philip Davies to the company’s headquarters in his constituency of Shipley, West Yorkshire. The visit followed Radio Design’s success in the recent Innovator/10 awards where the company won in the “Young Innovative Business” category. During the visit they discussed the recent emergency budget presented by The Chancellor of the Exchequer to Parliament on 22 June 2010. Mr Hawthorn agreed that concerns raised in his recent question to the Prime Minister regarding incentives and encouragement for entrepreneurs had been adequately addressed by the budget. Radio Design is becoming recognised as the world leader in the design and manufacture of bespoke filter solutions for network sharing applications. The company currently supplies custom designed filter systems to leading cellular infrastructure OEMs and cellular network operating companies worldwide. Radio Design products are used in some of the biggest shared cellular networks. 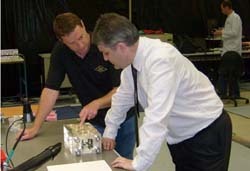 Radio Design operates from facilities in the UK, India and Finland.